I feel certain that most of you reading this right now own a copy of Shel Silverstein's 1964 book, The Giving Tree. If you don't own it, I know you have read it or had it read to you at some point in your existence. I still have the copy that was given to me by my brother on my 11th birthday in 1979 and I have memories of reading it as a kid and watching the animated version made in 1973 and narrated by Shel himself and loving it very much. Recently while talking about this book with a customer, I had a very interesting experience that lead to a discovery about my true feelings about The Giving Tree and how I currently interpret the text. This got me thinking. Many, many copies of this book are sold every year. Many, many adults have fond memories of it. But do people still read it? And if so, what do they make of it? There are many different ways to interpret the story and many different emotions elicited after reading it. 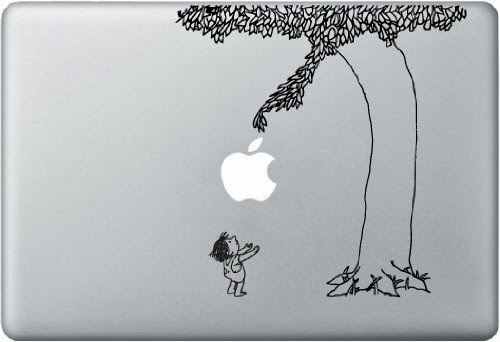 However, in an interview (which he rarely gave) with Publisher's Weekly in 1975 when asked to explain the popularity of The Giving Tree, Silverstein said, "Maybe it's that it presents just one idea." But what idea? Readers of mine, I want to know what place this book has in your lives? Do you own it? Do you read it to your kids? What do they think of it? What do you think of it? PLEASE COMMENT! I do not read The Giving Tree to my kids. In fact, I think I have actually come to loathe this book. These feelings came to the surface the other day when I was helping a customer who was new to the book and did not know the name of it, only the plot, find it on the shelf. This tiny, older Asian woman was so enamored of the book that her grandson had read to her that she could not stop gushing about it. I shared with her that I had my copy from when I was a child. She asked me if I loved the book too. I paused then decided to tell the truth (since she asked.) I told her I hated the book. I hated how selfless the tree was and how selfish the boy was and how sad it was that they both ended the story old, broken and with nothing left except themselves. I was a bit surprised by my reaction, but I think I know where it was coming from. As a mother, on a bad day I sometimes feel like these life-sucking little beasts are draining me of my own self and turning me into nothing more than a function, much like the boy and the Tree (who is identified as a SHE) in the story. I think I have been over identifying with the Tree and been feeling a little too angry at the selfish boy. While discussing this book with the customer, it occurred to me that it is possible to read this book from a Buddhist perspective. One Buddhist concept, simply put in American terms, is the idea that you always have more to give, even when you feel like you have nothing left. You are always the least important person in the room. Perhaps the Tree is exemplifying this quality? Perhaps she is selfless in the best way possible and not the doormat that she seems to be? As the customer pointed out to me, readers of the book can look at the behavior of the boy and make a conscious decision not to be like him, another positive reading of the text. Knowing that my interpretation of the book changed as a grew from a child to a mother, I became interested in other people's interpretations of the book. I read it to my kids. My seventeen year old, on the verge of starting her own adult life away from home, broke down in tears after reading the book. My six year old said (when asked) that it was sad and when was his macaroni and cheese going to be ready? My thirteen year old son believes that it is a message about how we keep taking and taking from nature, depleting her resources. My husband, who had it read to him as a child, feels that it represents the bittersweet nature of love and the way that the people we love are sometimes unable to love us back or love us in the way that we want to be loved. A friend of mine said she felt it should be called The Taking Boy instead of The Giving Tree. Whatever you take away from the book, however you feel about it, clearly Silverstein wrote a timeless, powerful book that sticks in our memory, however we remember it. I look forward to hearing how you interpret The Giving Tree, what you take away from it. and if you read it to your children. As a dedicated Mac user, this is my favorite. Naturally, there are many tattoos of images from the book. Shirts and Clocks, of course. The wedding ring has to be the most fascinating to me... I want to say that it misses the point. But does it? Obviously, some people are upset by the book. And, last but certainly not least, as a 30 Rock fan, there was no way I could leave out this picture of Tracy Morgan reading the book and sobbing. I find that this book and I'll Love You Forever elicit strong reactions. I don't mind the book, and I have read it to my children. I have read a bit on the topic. It bothers me that the tree is portrayed as female, and she gives to the point of nothingness. I do believe that sometimes children take a lot from their parents and go about living their own lives without regard to their parents and their "sacrifices." My children do see the ecological ramifications of the book and also the more buddhist message of giving what you have and always having more to give. Interesting topic. I HATE this book. I own a copy, because one of my best friends gave it to my mother as a present when I was around 12. Her own parents were kind of wretched and I guess she saw my mother as the tree character, and meant it as a great gesture. My friend loved the book. I just read "The Giving Tree" to my 4 year old daughter the other night! We have a hardcover copy that was purchased for an older child in the family when he was young. To know that real giving can hurt and be unappreciated and taken for granted but that it doesn't make the giving any less powerful. And then I give and receive a truly loving embrace from my sweet daughter and we move onto another book. A microcosm of life itself. After seeing it on every must read book list, I first read The Giving Tree last year when my oldest had just turned 4. I always preread the books to make sure that it is appropriate for my kids. After reading the book I felt profoundly sad. I immediately returned the book to the library w/0 sharing it with them. Interestingly, while the boy's poor treatment of the tree bothered me it was secondary to the despair the man experienced becoming elderly and alone, having lead an unfulfilling life. A few months ago I saw a brand new copy for $.25 and I couldn't pass it up even though I strongly disliked the book. I have yet to read it to my children. I think I will though at about the age of 6 or 7 because I do like to discuss various topics with my kids and I think this will provide ample opportunity for that: selfishness, selfishness, abuse, personal fulfillment etc. Thanks so much everyone who has shared their experiences, thoughts and feelings about the book. I think that no one would say that this book doesn't deserve to be a contemporary classic, but I feel like it is so hard to say precisely WHY it is so timeless and what of value can we take away from it. I think that, being such an intense experience economically packed into so few pages and with such simple (but powerful) line illustrations, this book is almost a conundrum. We are presented with a very mature message (whatever you think that message is) in a simplistic format (or one that we have been conditioned to think of as simplistic) and there is almost a dichotomy between the ideas and the means to conveying those ideas. How are we supposed to explain the profound experiences of the tree and the boy to little listeners? Are we being irresponsible if we don't explain it at all? Maybe the true benefit of the book is the act of exposing a child to it without explanation and letting him/her think about it, grow with it and come to an understanding of her/his own. The main message does seem to be open to interpretation, so that maybe trying to make sense of it develops a child's higher level thinking skills. It's amazing to me how such a simple text can generate such high and intense levels of thought and emotion among us! I don't have kids but I still enjoy this book as a contemporary read for adults. I volunteer for Seattle Hempfest that I work hundreds of hours preparing for every year, in fact about 50 of us do. I see us all as the Tree and our attendee's as the Boy. Between festivals I create art (I'm not an artist) for the festival only to have some taken from me by the attendees. The attendee's (the boy) taking my art was quite an energy drain at first but then a friend said, "they really like your art, that's why they take it." This was the first form of acceptance of my art that made me feel like what I created was needed otherwise they wouldn't take it from me. A contemporary read for adults to understand others. I have had several different thoughts on this over the years. As a child, I thought the boy was such a mean kid, and wished I could rescue the tree. As a young adult, after the death of my grandmother, the story broke my heart, because I realized that i was the boy, and she was my giving tree. Now, as a parent, I find myself sometimes feeling like I imagine the tree felt, wishing I had more to give to the little boy I love so much. This was one of the first books we bought for our son's collection when we found out we were expecting. I read it to him about once a month, and hope that it will help teach him the importance of being thankful for the ones that love you, and would give you anything. Nicki - I think you actually covered all the reasons that the book is still on the shelf and still read over and over - it means something different to everyone at different times. At first I was frustrated that Silverstein didn't explain the book or even comment on it but now I think that was true genius on his part. It is what we make of it, when we make something of it. Thanks for your insight! I feel this book seeks to exemplify the complex but ultimately consumerist way man interacts with his natural environment. The love of nature and the nostalgia associated with experiencing its pleasures does not dissuade our need to use to the point of destruction. The personification of the tree as female seeks to further exemplify the nurturing nature of the tree (Mother) and the impetuous nature of the boy - who is never called anything but boy, even in old age. As much as there are negative elements to this relationship, I can't hate this book any more than I could hate a kid throwing a tantrum in front of his Mom. Well said, Dr. And non-judging. Thanks for your thoughts. Oh My goodness... i've always felt like a whacko for loathing this book,And "I'll love you Forever," which, to me, will always be "The Stalker Book." I'm so comforted that there are other, not perfectly selfless "angelmother" kinda women and men out there who think that teaching children to take and take and take because others just want to give and give and give is NOT A GOOD IDEA.... Sigh...Or that climbing into a window and cradling your adult child and rocking them is a good idea. I mean, HOW is that "kid" not awake... is he drugged or something? As to the "I'll Love You Forever" book, the crawling into the window is not supposed to paint a literal picture. It is simply a poetic way of describing how a mother's love for her child goes on and never changes throughout the life of the child, even though the child itself does change. I've actually never read "The Giving Tree", but because of this blog and all the comments I've read I am very curious to read it. I'm so glad to have all of these insights going into it! I appreciate your interpretation of the mother crawling through the window but it still creeps me out, metaphorical or not. Actually, your comment helped me see a connection between both books. Even though THE GIVING TREE is artful and spare in its presentation and story telling and I'LL LOVE YOU FOREVER is maudlin, syrupy and hideously illustrated, BOTH books have a character that gives selflessly and takes whatever paltry return expressions of love and thanks (if any) are thrown back her way, never asking anything of the "child." Even Jesus asked things of his followers and had expectations for their behavior, but the tree and the singing mother don't, and THAT is the kernel of these books that rubs me the wrong way and elicits strong feelings. Thanks so much for your comment, Jennifer! Wow, what an interesting thread! I haven't read The Giving Tree since I was a child, but although I read Shel Silverstein poems to my children, I knew right away that I wouldn't be reading The Giving Tree to them. I enjoyed reading all the different views here on the story, including the Buddhist message. My strongest memory of this book is having it read to my 7th grade class in Catholic school by a strict spinster teacher who was retiring. It was part of her goodbye and I think she identified with the tree. I saw it as a story of martyrdom. My impression as a child/adolescent was that the tree was good and selfess and we should be like that tree. But I didn't think anyone should be like the tree. Martyrs are revered in Catholic culture and I felt my own mother felt like she should sacrifice her own comfort and happiness for her children. But she just seemed unhappy and I just felt guilty. I think the relationship between the boy and the tree is so unhealthy and wrong. But reading some of the comments, maybe that is the point. Maybe we aren't supposed to see the tree as a role model, but as a warning. I don't know. I just know I don't like it. And I HATE I Love You Forever, too! I've read the criticism of the stalking behavior but that isn't what bothers me. What bothers me is that the book only highlights the negative behaviors of each age when there are so, so many positives. It's like the child is just horrible but the mother loves him anyway because that is what mothers do. It's very one-sided to me and disturbing. And I also dislike that she only shows him affection when he is sleeping. I actually haven't found a single Robert Munsch book I like, but I disklike that one by far the most. I did not read this book as a child. When my kids were little, The Giving Tree came highly recommended, so I read it prior to reading it aloud. I LOATHED it (I like other Shel Silverstein books) and did not read it to my kids. I didn't want my kids saddled with that idea of celebrating giving your all without ever getting your own needs met. I think you made a good choice there. I agree with a lot of the comments here - the ones who are moved by the story and also the ones who loathe it. I see myself in the boy and in the tree, and I don't like either side. Both roles make me very sad. In fact, for some reason I don't quite understand, I've been crying the whole time I've been writing this. Perhaps it is that deep emotional tug that gets to the heart of why we keep reading this painful book. Love it or hate it, it moves us. P.S. In our house, my partner and I call it The Codependent Tree. Also, I absolutely agree that I love You Forever is CREEPY! Denise - So well put! And I think you also really capture why this book is still being purchased, given as a gift and read widely. Maybe the fact that this powerful, ambiguous message comes in the form of a children's picture book is what makes the books stay with readers, for good or bad. I think there was a bigger picture. I always have felt that the boy does represent helplessness, selfishness...the world, more or less. But the story is about the TREE, which represents more than a single "mother" - but more the Earth itself, and all that we take from it, deface it, and need from it...it gives. @inkling - I really like your interpretation and continue to be amazed by the many interpretations this book allows for. However you read it, Silverstein is a genius for writing a story that resonates on so many levels and stirs up so many emotions and with an enduring message that is almost impossible to distill into one sentiment. I received "The Giving Tree" (which my mother and I both hated when I was a child) as a baby gift when I was pregnant with my oldest (who is now almost 7). I have never read it to him. It just sits on the shelf. At the end of the book, my daughter sat silent, as if stunned, for a moment, and then said, "Let's NEVER read this book again." I told her I agreed. What I should add is that my interpretation of the book has always been that it is meant to make children feel guilty for the sacrifices made for them by their parents. (It has been interesting to read here the other interpretations, which I have never considered.) I just don't think that is right. Children should not feel guilty about their parents trying to be good parents. There is a great description of the parent/child obligation in a Bujold book (Mirror Dance? ), in which a character states that of course you could never truly pay your parents back for all the things they do for you. That debt you repay to your own children, or, if you don't have children of your own, to the world at large. I love that--that is how it should work: no one should feel bad about being loved and taken care of. Being taken care of by your parents is just the proper order of things. We should just remember our obligation to care for others. @Jessica - Thanks so much for sharing your daughter's response to the book and your very interesting read on it. Do you think it's all all possible that that is what Silverstein meant? That, as you put it, no one should ever feel bad about being loved and being taken care of? They boy sure doesn't seem to feel bad about it and the Tree doesn't either. I think that after two and a half years of people sharing their interpretations, you may have hit on it. It's pretty subtle and I doubt that it's actually what Silvertstein intended, but it makes the most sense to me. I think that he probably saw his parents sacrifice for him, but how many generations since his see their parents sacrificing - in the way of the Tree - to give their kids a good life? That's a very white, middle class statement of me and I apologize. And the middle class is definitely shrinking. My interpretation has always been that Silverstein meant children to feel guilty about (or at least painfully aware of) their parents' sacrifices. That is why I have always disliked The Giving Tree, because I think it is wrong to make children feel that way. As the young reader, we dislike or are frustrated with the Boy because he is so ungrateful, but we also know that our parents are doing this for us. What is a child supposed to do with those feelings? Stop their parents from doing things for them? Figure out a way to pay them back? They can't do those things, so all that is left is for them to feel bad. I think that is wrong. The tree does feel bad at one point--remember, one of the lines is something like, "And the tree was happy. But not really." For Pete's sake. So I dislike the book. When I told my mom about my daughter's reaction, she suggested we burn it in some sort of ceremony. I don't think I will go that far, but I did make a promise never to read it again. P.S. Both my kids like Love You Forever, though I could do without it. I have never assumed that the mom only expressed her love at night, I admit, only that she loved him so much that she had to be with him even while he was asleep. I think that idea appeals to my kids. They really like it if I leave them notes while they are asleep. I agree that I don't love the whole even-though-the-kid-has-all-these-vaguely-annoying-age-appropriate-qualities-she-still-loves-him aspect of it. I cannot abide the scene in which she climbs through his window. If he did not give her a spare key, there was a reason. @Jessica - I guess it takes an experienced, adult eye to read THE GIVING TREE and come away with the interpretation that "no one should ever feel guilty for being loved and taken care of," and it's unrealistic of kids to gather that subtle interpretation. As you noted, they tend to respond to the more black and white aspects of the book - the boy being selfish and greedy and the tree becoming less of a tree every time she gives to the boy. It makes sense that your kids love LOVE YOU FOREVER because, despite what we adults perceive as creepy about the book, there is a recognizable (to little kids especially) expression of love on the part of the mother. The Tree giving of herself over and over to the boy is an expression of love, but the boy never gives back the way the son in LOVE YOU FOREVER ultimately does. I wish Shel Silverstein would tell us what he meant! Healing thoughts to you and your daughter. Yet again, it's your turn to be the tree. And don't you understand how she feels, just a little bit more, every day you are a mother? I believe in the next life and that our lot will be determined by our actions here. That tree will be planted in the best spot in heaven and will be glorious and beautiful for eternity. I thought the wedding ring captured the point of marriage very well. And that, too, will be rewarded richly in the next life. I review at TheProfitofBooks.blogspot.com. Best wishes! @bookworm - Thanks for your healing thoughts and kind words! you may be intrigued by what a couple of professors of ethics and humanities had to say about it. I had the same thought as you. I asked out loud, "Has anyone ever interviewed Shel Silverstein and asked him what he meant?" (Let's get it from the source...but even in not giving it away proves his genius. it keeps us thinking and guessing and keeps the story alive. As I was writing what the book has meant to me in light of the Tree as God, or a devoted parent, I could also view it as a codependent relationship that results in disaster. Perhaps, Mr. Silverstein is simply that talented to make a story have two polarized meanings. @anonymous - Thanks for the link! That was an interesting article. I have to agree with you that Silverstein is so talented that he created a seemingly simple story with two polarized meanings. I can't think of any other picture book that achieves this! I loved the book when I first read it as a teenager, because it showed all the hard edges of love. Then as an adult I became uncomfortable with it because I couldn't see the tree as anything else but a person who sacrificed her own self to the point of non-existance out of "love". Now I can read it again without such sadness, seeing the tree as a being, though not necessarily a person, and appreciate the spirit of unconditional love represented, and the endless urge to give of itself, and I think perhaps there are many non-human relationships we have throughout our lives that nourish and support us whether or not we're always mindful of them, or focused on them to the same degree. One easy example would be a dog, as anyone who's had a dog will recognize that huge heart always broadcasting unconditional love our way, happiest when they can do something for us- and there's nothing uncomfortable about that for us. Likewise so many inhabitants of our planet- I think of my little herb garden that gives of itself to me constantly- I cut it back harshly and it seems to thrive from the use. We are all part of an ecosystem that is constantly flowing between some part taking and another part giving and it is all part of the dance. We don't think of the deer as selfish for eating the garden- the deer in its turn will feed some other being, and it all goes around and around. I loved the song Puff the Magic Dragon as a child too, although it made me cry every time. I felt so sad for Puff as Jackie grew up & away, and there are obviously many similarities to The Giving Tree there, and I think it does say something about growing up that *is* sad- we *do* grow up & away, all of us, and even though it's sad in one way, it is the nature of being human and part of the nature of time we have to reconcile ourselves to eventually. The boy makes his own journey, which is a hard truth for adults to read about, since we are hard into our own part of the cycle of busyness and running around not being much in tune with the satisfaction of being instead of doing. I think you can look at the boy as a cautionary tale about the ephemeral joys of big adventures & careers, as these worthwhile ways of living your life still come to old age the same as the rest of us, and we'd better make sure we tend to the relationships that sustain us all along the way, not just as consolation prize at the end of it all. Had the boy been more constant in his attendance of the tree, his life would have been the richer for it, rather than just popping in to get something and run off again. We see that all his activities have not fulfilled him in the end. However, the tree *is* fulfilled, regardless of the boy's attention or lack of it. Her balance was not dependent on the boy reciprocating in a certain way, it is hard not to notice. It definitely says something deep and profound about the nature of being human and the quest of individual identity. I think it's appropriate that we have complex feelings in our reaction to it. @ Anonymous 7/12/14 - Thank you for sharing your thoughts. While I have enjoyed and expanded from all the comments shared here, yours really helped me look at this book from a new perspective and definitely with a new appreciation for the book. I think you are so right that this book is hard for us to read as adults because we are in the moment where the boy is taking everything the tree has to offer and is seemingly too wrapped up in his own life to appreciate it. Hard stuff. I had thought of how much I dislike to read the book before, for exactly the same reasons you stated. However, I had never thought about the idea of no matter how much we give we still have something left to give. It is true. I do get angry with the boy sometimes, mostly because I was a very selfish person in my teen years...on into the twenties...still working on it. Oh, and I forgot to mention the book Love You Forever...I DISLIKE that book...but only because it is so sad. I don't like to think about my boys having to take care of me like that. I have regifted or discarded(in the trash) every copy I have received...all at baby showers during my four pregnancies.